Posted in: Dee Why. Tags: ESE-1m-10s. Energy’s faded out where Dee Why’s concerned this morning. At 0600 the MHL buoy off Sydney was detecting a metre of 10-second ESE swell. Tide was low at 0700, but even though it’s coming in now, the point was unsurfably small and any waves along the beach were too small to be seen above the dune line from RealSurf HQ. This morning’s swell models are predicting flatness, or near enough, through to Friday when there seems to be a small hope of a wave or two for the morning session. By then your correspondent will be not only weighing the charts on your behalf, but be paying close attention to their Californian counterparts…(which are looking pretty sad atm). Have a great Tuesday one and all! A strong high pressure system is centred near the New South Wales coast and is moving slowly eastwards over the Tasman Sea. A trough is expected to bring south to southwesterly change during Thursday. Southerly around 1 metre, increasing to 1 to 1.5 metres offshore. Northerly 10 to 15 knots, reaching up to 20 knots offshore early in the morning. Winds turning northwesterly in the late evening. 1 to 1.5 metres, decreasing below 1 metre around midday. Partly cloudy. 30% chance of rain at night. The chance of a thunderstorm in the evening. Variable about 10 knots becoming southerly 15 to 20 knots during the morning. Southeasterly below 1 metre, tending southerly 1.5 to 2.5 metres during the morning. Posted in: Dee Why. Tags: 19C, ESE-1m-10s. Beautiful morning in Sydney but not much going on wavewise. Dee Why point was offline and the beachy was struggling to produce anything above knee high as the tide approached high at 0800. The MHL buoy was showing about a metre of 10-second period ESE swell. Winds were light and the surface conditions smooth, so it’d still be a nice morning for a paddle, even if you don’t have much prospect of an exciting wave. The swell models have a springish tinge. Outlook for tomorrow is again marginal and although a short-period south pulse continues to appear in the cards for Friday, but so too does a wind forecast for strong southerlies. It looks like there might possibly be a slightly better wind outlook for Saturday, but there may only be a few tiny scraps of south wind swell to work with. Beyond that it appears we’ll have only tiny dribble until late next week – if then. Keep on smilin’ and have yourself a top old day! A high pressure system over the central Tasman Sea extends a ridge towards northeast New South Wales, and is directing east to northeasterly winds along the coast. Winds will become fresh to strong in most areas today as a low pressure trough approaches from the west. This trough is forecast to bring a southerly change to southern and central parts of the coast during Thursday, extending to the north coast early Friday. Another high is forecast to move in behind the trough later Friday and should remain the dominant feature in the region through the weekend, with winds gradually easing before shifting more northerly again. Variable 5 to 10 knots inshore at first, otherwise north to northeasterly 15 to 20 knots, reaching 25 knots by evening. Northerly 15 to 20 knots ahead of a southerly change 15 to 25 knots around the middle of the day. Southeasterly around 1 metre, tending northeasterly 1 to 1.5 metres during the morning. Southerly 20 to 30 knots. 2 to 3 metres, decreasing to 1 to 1.5 metres during the evening. Northeast to southeasterly below 1 metre. Posted in: Dee Why. Tags: 17C, ESE-1m-10s. Just saw Manly and Curly and can report that as of 0900 there were some chest high sets at both places. At Manly it was all up the Queensie end and at Curly it appeared to be right along the beach. There seemed to be a reasonable wait for the rideable ones to turn up, but at least it’s not flat. Curly was sparsely populated at 0900 even though there were waves. 0800: Some waist high little sets along the beach at Dee Why but only the tiniest little line trickling along the rocks at the point. Swell is ESE at about a metre with a period of just under 10 seconds. Water temp out at the buoy is 17C. There were a few people in the water along the beach where it looked to be reasonably consistent, if small. Swell is set to hang around at about this size today but to drop down another notch tomorrow – which will probably mean it goes flat. And, if the models have it right, it’ll stay that way for at least a week. Hope they’re wrong..
Northerly about 10 knots increasing to 15 to 20 knots in the morning. Around 1 metre, increasing to 1.5 metres later in the evening. The chance of thunderstorms offshore later this afternoon and evening. North to northwesterly 10 to 15 knots, reaching up to 20 knots offshore early in the morning. The chance of thunderstorms offshore from the late morning, extending throughout during the late afternoon and evening. Northwesterly 15 to 20 knots turning southwesterly during the day. Posted in: Surf Reports. Tags: ESE-1m-10s. Not a lot going on at the beach this morning, but you could get the odd knee to waist high thing if you’re in the right spot at the right time. Swell is out of the ESE at about 10 seconds apart. It’s showing about a metre out at sea, but there aren’t too many metre high wave faces around the place. There were a few such up the beach from Dee Why and it looked from the crowd as though there were similar things going on at Northy. Tide is low at 0820, so you’d want to get on it soon because once it comes back in, I’d be surprised if anywhere would be surfable. PARTY – Friday 20th June – Avalon Bowls Club 6pm till late – $20 for BBQ, Beer, Bands and on-stage chat with Aussie Surf Legends Buy tickets here. PARTY – Sunday 22nd June – Havana Beach Cafe & Lounge, Manly 6pm till late – $10 for Live music from Angus Bird and surf films. Buy tickets here. A high pressure system off the northern NSW coast will move steadily east during Friday and Saturday as a weakening trough slowly crosses NSW and then the western Tasman Sea. A weak high will form over NSW during Sunday before a major cold front crosses the state on Monday, likely reaching the coast Monday night. Northwesterly 15 to 20 knots tending westerly in the late evening. The chance of thunderstorms offshore during this evening. Westerly 10 to 15 knots, reaching up to 20 knots offshore early in the morning. Southerly around 1 metre, increasing to 1 to 1.5 metres by early evening. Southwesterly 10 to 15 knots becoming west to southwesterly below 10 knots during the evening. International Surfing Day is a worldwide celebration of the sport of surfing and the protection of our ocean, waves and beaches. Surfrider encourages surfers and ocean enthusiasts to stand up and realise the connection between the sport they enjoy and the protection of our environment. If surfers don’t take action about the waves and beaches they surf and love, who will? So what can you do this International Surfing Day? Buy a block of wax! Surf Organic will donate 30% of the sale to Surfrider! Surfrider is a grassroots organisation and we’d love to see our local supporters getting involved and celebrating International Surfing Day! For the waves and beaches. Surf Organic will donate 30% of all sales to Surfrider to celebrate International Surfing Day! $10 PARTY – Friday 20th June – Avalon Bowls Club 6pm till late – BBQ, Beer, Bands and on-stage chat with Aussie Surf Legends (see attached flyer) Buy tickets here. PARTY – Sunday 22nd June – Havana Beach Cafe & Lounge, Manly 6pm till late – Live music from Angus Bird and surf films. Buy tickets here. FREE SURF SESSION – Saturday 21st June – Merewether Beach 7am till 12pm – Surf expression session, live music, art and supporter stalls! $5 FILM NIGHT – Saturday 21st June – Broulee Surf Club (Heats St, Broulee) 7pm till late – screening Tim Bonython’s ‘Immersion’. Buy tickets here. FREE FILM NIGHT – Saturday 21st June – The Howlin’ Wolf Bar (Crown St, Wollongong) 7pm till late – screening Nathan Oldfield’s ‘The Heart and the Sea’. There might be a possible little wave for the early at spots that were surfable yesterday. At 0400 there was still about a metre of ESE swell at 10 sec – but it won’t last long because the wind’s due to pick up to gale strength. It’ll be NW then west up to 25-30 kts by lunch time. Pretty much going to blow everything flat. Looks like a good rest day. We should see obvious signs of a brief but intense south swell event starting to develop from dawn. The Bureau says we should have around two metres of straight south swell by daybreak, quickly building to 3-4 metres. Wind will still be powering westerlies of 20-30 kts, so conditions will be testing and obviously suitable for experienced riders only. Swell should last through Monday and into Tuesday. Winds are set to be west 15-20 kts Monday, so conditions are likely to be pretty good. Again, you’ll want to be reasonably experienced to take it on. And from the shape of the forecast models, we should have waves right through to next weekend… oh-woo! A complex low is developing over southern New South Wales and Victoria, with a trough deepening off the coast. The low is expected to deepen rapidly as it moves offshore during today. This pattern will maintain vigorous winds along most of the coast through the weekend, easing later on Sunday as the low moves away and the next high pressure ridge extends across from the west. Northwesterly 20 to 30 knots turning westerly 25 to 30 knots in the middle of the day. Winds reaching up to 35 knots offshore during the afternoon and evening. 1 to 1.5 metres, increasing to 2 to 3 metres during the morning, then increasing to 2.5 to 4 metres around midday. The chance of thunderstorms offshore. Southerly 1.5 to 2.5 metres, increasing to 3 to 4 metres during the morning. The chance of thunderstorms offshore in the morning. Westerly 15 to 20 knots decreasing to about 10 to 15 knots during the evening. 1 to 2 metres, decreasing below 1 metre during the morning. Posted in: At large. Tags: Crescent Head, ESE-1m-10s. As foretold by the swell models, there was a bit more swell up north than in Sydney again today. We need to be back in Sydney by 5, so surfin’ had to finish by around 1100. We started the morning with a quick look at the point With our peerless local guide Greg. Sadly, it was getting mauled by a steady north wind and after watching for awhile, we decided not to join the 20 or so in the water chasing occasional chest high sets, but instead went over the hill to get out of the wind. The beach break was strictly so-so because the fading east swell had a fair amount of north bump running through it, plus the banks weren’t too good. Size was okay, but for the most part they were one-turn wonder waves that invariably ended in a thumping shut down. After thrashing around for an hour or so, we decided to go back to the caravan park to grab our stuff and take off for home, resigning ourselves to not getting a mal sesh in. But, wonder of wonders, when we got back to the point, the wind had faded to a light breeze, there were still sets and thanks to changeover, not too many in the water. So, it was mals to the fore and we paddled out for a few quick ones before making for home. We both managed to score some very long rides from the point to about half way to the shorey. Very fun. I had my waterproof(ish) camera along and I tried shooting some video for you. Not sure on that front, as I haven’t had a chance to look at it. We’re now on the road rolling southward for Sydney where it looks from the latest MHL data to be a marginal metre or so from the ESE at around 10s. A quick glance at the models, seems to indicate that the swell will maintain its generally lacklustre quality for another week at least, although at least one set of predictions were being a little hopeful about mid next week. Tomorrow’s election day, so I hope you’ve used the ABC’s excellent Vote Compass taken a chance to compare your own perspective with what’s being proposed by the different parties. I have to confess to feeling very downhearted about the likely changes coming our way as a party that generally regards climate change as an annoying and trivial enthusiasm of climate scientists and ratbag environmentalists. This morning and yesterday when I was walking along the beaches south of Crescent Head, the sand dunes were very clearly cut back by coastal erosion. You can see the same thing up at North Narrabeen. And today was 30 degrees as we drove south. It’s the hottest year on record so far. Mother nature isn’t messing about and pretending otherwise in my view is telling our kids and grandkids that we just don’t care, we just can’t be bothered. I rarely mention politics because I know that isn’t why people visit the site, but at election time, I believe it is not inappropriate. A high pressure system over the Tasman Sea extends a ridge into New South Wales and will remain the dominant feature over the next few days. A weak trough is expected to bring a southerly change to the central parts of the coast Friday morning. The trough is expected to be slow moving over the weekend. East to southeasterly around 1 metre. Variable about 10 knots becoming southeasterly 10 to 15 knots in the late afternoon. Up to 1 metre, increasing to 1 to 1.5 metres later in the evening. Southeasterly 10 to 15 knots becoming easterly about 10 knots during the afternoon. Posted in: Dee Why. Tags: 104d-1.1m-9.8s, ESE-1m-10s. Was hoping for a bit more energy this morning. But instead awoke to discover that we have about a metre of ESE wind dreck which, were it not for an average period of almost 10 seconds, would be totally uncatchable. If you’re keen, Dee Why is delivering knee high with the odd waist. Not much oomph to ’em, so I’d take the largest and floatiest option in the arsenal. The first puffs of NE wind were making themselves felt at 0730, so the surface conditions will gradually go downhill at most places. The Bureau tells us that we should start to see some TC Evan energy from tomorrow. The models reckon around the middle part of the day – ie, right about when the wind goes around to the SE. Blergh. However… south corners could have some sideshore but okay waves if we’re lucky. Of course the tide’ll be high mid-afternoon, so quality will be a juggling act. The Bureau reckons the energy will last about 72 hours, there should be a few opportunities around the place with any luck. A broad high pressure ridge over the Tasman Sea is weakening. A southerly change associated with a cold front crossing the southern Tasman Sea will develop on New South Wales far south coast early on Thursday. The change will move along the south and central coasts before weakening on the far north coast on Friday. Following the front another high pressure system is expected to move east of Tasmania later on Friday extending a ridge to north coast. East to southeasterly about 10 knots tending east to northeasterly 15 to 20 knots later in the morning. Below 1 metre increasing to 1.5 metres later in the evening. North to northeasterly 15 to 20 knots tending north to northwesterly early in the morning then shifting southeasterly in the early afternoon. Easterly 1 to 2 metres. Large swells breaking dangerously close inshore. South to southeasterly 15 to 20 knots tending east to southeasterly 10 to 15 knots during the day. Northeasterly 2 metres tending easterly from the morning. Posted in: Big Picture. Tags: ESE-1m-10s. Well, that was fun. Drove from Hay to home in a day. As we set out I said to the family, “I wonder where we’ll see the first car with boards on top…” Turned out to be way earlier than I expected. Instead of somewhere near Sydney, I spotted a couple mals atop a serious looking long distance surf mobile in a tiny little town called Weethale. Between there and about West Wyalong we were only seeing a car every 10 minutes, so I was impressed. But here’s the kicker, we did not see any more boards after that. Not a one. As usual under such circumstances, I hope to be proven spectacularly wrong. I’m hanging out to get wet after a week away from waves! Go well and catchya tomorrow morning. Sunday until midnight: Wind: North to northwesterly 10 to 15 knots becoming northwesterly 15 to 20 knots by early evening.Sea: Below 1 metre increasing to 1 to 2 metres offshore by early evening.Swell: Southeasterly 1 to 1.5 metres. Monday: Wind: West to northwesterly 15 to 20 knots tending westerly 10 to 15 knots during the morning then tending southwesterly during the afternoon. Winds southerly 20 to 25 knots later in the evening.Sea: Below 1.5 metres rising up to 2.5 metres offshore in the evening.Swell: East to southeast to 1 metre. Tuesday: Wind: South to southwesterly 20 to 30 knots decreasing to 10 to 20 knots during the afternoon. Wednesday: Wind: South to southwesterly 15 to 25 knots, increasing to 20 to 30 knots around dawn. 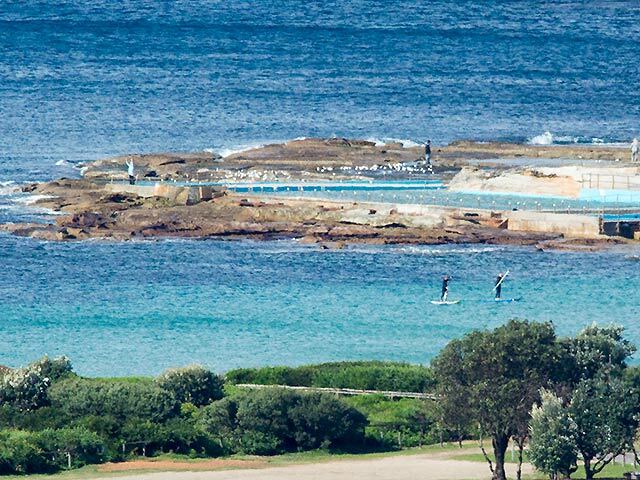 Posted in: Big Picture, Dee Why. Tags: 5/10, ESE-1m-10s. Swell is now averaging around a metre from the ESE in Sydney. Fortunately the period is 10 seconds, so there are still some fun looking chest high sets at Dee Why beach (and, I have no doubt, numerous other locales). The point is smaller and less consistent, but there are a few bods in attendance to make sure nothing gets through unridden. At 0730 it looked almost glassy, but the Bureau’s call (see below) is for SW-S change to rattle through the place this morning. With luck, the swell should stick around through the day. If you’re waiting for the post high tide opportunities (it’s at 1033), you should be in with a chance. Could be a shower around later though. From Thursday onward it would seem that we’re in for increasingly southerly conditions. The models are showing the swell pushing up into the 3-4 metre range from the S to SSE, but with 15-20 kts of ESE wind. So, not all that attractive looking really. Have yourself a great old day! Wednesday until midnight: Wind: W/NW 5/10 knots, ahead of a SW/S change 13/18 knots during the morning. Sea: to 1 metre, rising to 1 to 1.5 metres. Swell: E/SE about 1.5 metres. Possible thunderstorms. Thursday: Wind: S 15/25 knots. Sea: 1.5 to 2.5 metres. Swell: SE 1 to 1.5 metres. Friday: Wind: S 20/30 knots. Looks like a fun one to me.